It's remarkable how quickly things change in the sewing world. Of all the sub-cultures I'm involved with, this industry is by far the most responsive to changing consumer demands. 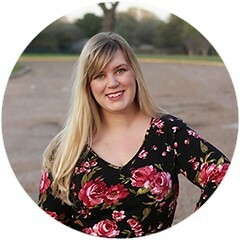 In just the five years I've been blogging, we've seen a remarkable expansion of size ranges for many pattern companies, an increase in youthful, modern design aesthetics, and a greater availability of apparel fabrics from major suppliers and retailers. On a more personal note, shirtdresses are also everywhere nowadays. Once upon a time, I couldn't find a single pattern that I liked. Options in my size were severely limited and those available took too many cheats--collars without stands, no separate button bands, and other things that made me want to turn green and start throwing cars. Cut to this year. 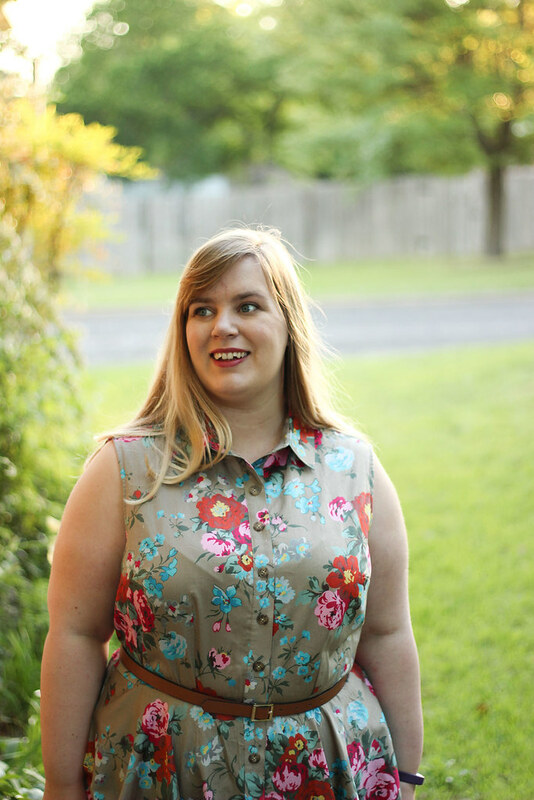 Last month, I wrote a post for the Curvy Sewing Collective outlining plus size options for shirtdresses. There were so many great patterns that I had to actively cull my list to a top eleven. The mind, it boggles. 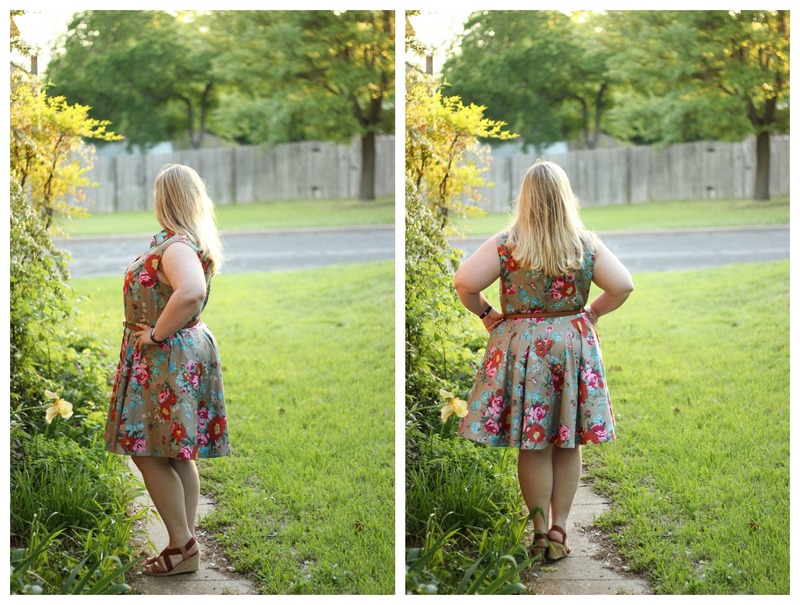 With so many new patterns available, it's time to (temporarily) retire my go-to shirtdress, McCall's 6696. While I still love its classic styling, there are too many new designs calling my name. Why tread over familiar ground, when there's a whole world of shirtdresses waiting to be explored? First up on my list, we have View D of McCall's 7351. Admittedly, I didn't stray far from the familiar here. Baby steps, kittens. This is every inch a classic, fit-and-flare shirtdress. There are separate button bands, a stand collar, and darted bodice. Unlike M6696, however, this dress has a semi-circle skirt and omits the separate waistband with belt loops. Those are actually major improvements over my TNT pattern in one way: construction time. From cutting to hemming, this dress took me three nights of sewing, or about five hours total. Maybe I'm a slow sewer, but M6696 usually takes me at least eight hours from start to finish. 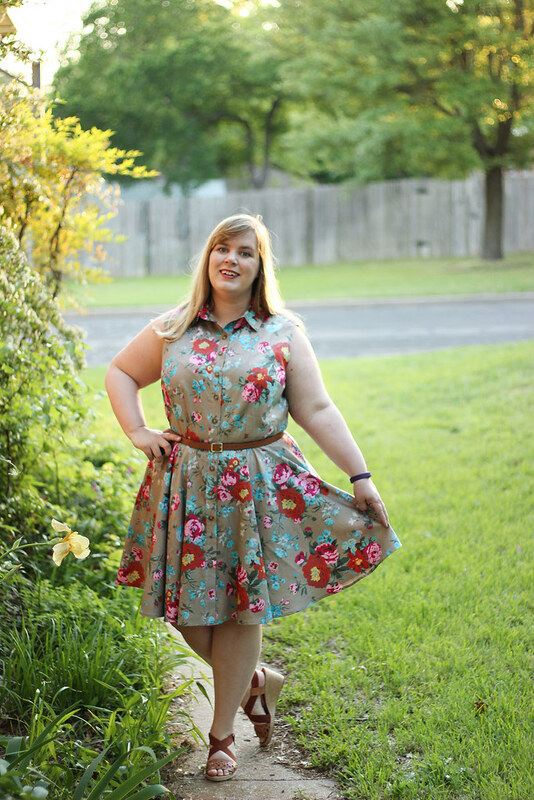 Based on ease of sewing alone, this new pattern is a winner! Of course, some adjustments were made. If you look at the line drawing above, you'll notice that M7351 is a single-dart bodice. Though the pattern comes with different cup sizes (up to a D-cup) that original design was a no-go for me. Based on my high bust, I chose size 20, which would still need a complete Full Bust Adjustment. That FBA meant either creating one gigantic dart or adding a second dart along the waistline. Y'all, I am not a masochist. Preservation of design integrity is all well and good, but I went with the second option. Full Bust Adjustment -- I added one inch to the bodice pattern, which is two inches of ease total. This added a second dart along the waist seam, pointing directly at my bust apex. Lengthened Darts -- After an initial muslin, I knew the darts needed quite a bit of added length, because they were pointy and ended on the side of my bust. Egads! This is pretty standard for me in cup-sized patterns, actually. Perhaps my bosoms are just weirdly spaced for their size, but I'm forever lengthening darts. An added two inches of length worked nicely. Narrow Shoulder Adjustment -- I narrowed the shoulder by 1/2 inch and will probably narrow it further on my next version. Reshaped Armscye -- This was actually done after the version of M7351 that you're seeing today. Initially I thought it was low, but perfectly fine since it didn't expose my bra at all. After wearing it once in public, I've rethought that decision and raised the armscyes by 3/4 inch. On the back bodice, my only alterations were to narrow the shoulder and raise the armscye, in conjunction with my front pattern piece. Otherwise, the back bodice fit was on point. When it comes to the final fit, I really like this pattern. It's demonstrably looser than my TNT pattern, but that gives it a more relaxed, casual vibe that I dig. I didn't take any pictures sans belt, so you'll have to trust me on this one, but there's a pretty large amount of ease at the waist specifically. This prevents the button band from gaping and seems intentional, judging from the modeled photos. Without the belt, this dress almost has a Grainline Alder silhouette, though it's not nearly as loose. With the belt, there's a classic, blousy Romancing the Stone sort of look happening. This does cause some shifting of the loose fabric, but I like the extra ease a lot. When summer rolls around in Texas, a relaxed shirtdress is a godsend. Additionally, the collar on this pattern is fabulous. 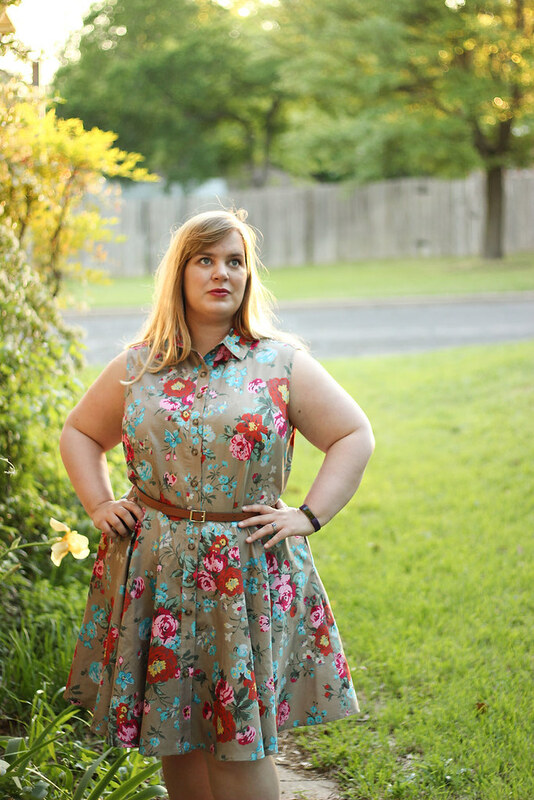 If you had trouble with M6696 being way oversized at the neck, you're going to love M7351. If I put a button at the collar band, it would actually close and fit my neck properly! Admittedly, I didn't put one there, but...nonetheless. I swear to God, the top-stitching is even. Weird camera angles FTW? If you're drooling over this fabric, I have good news for you. This floral cotton sateen is from Mood, comes in three colorways, and is still available. I chose the medium beige color, because I couldn't stop imagining an updated take on the iconic khaki shirtdress. It's archaeology* chic with flowers. Who could resist? This entire dress was sewn on a machine, because top-stitching is both a detail and a shortcut. Huzzah for shortcuts! I chose a khaki thread slightly lighter than the khaki of my fabric, so that it would pop against the print. Then, I set my stitch length a little longer than usual (2.8), popped on my edge stitching foot, and sewed everything slowly and carefully. The buttons, a neutral tortoiseshell, are from JoAnn Fabrics. *I have been informed by dear archaeologist friends that dig clothes are actually loose, covered in dirt, and imminently practical. Personally, I will continue to imagine The Mummy--khaki, linen, and really awesome boots. Y'all, I adore this dress. The full skirt, that perfect collar. It's such a dishy variation on my favorite style. Despite my pledge to sew all the shirtdress patterns, my next project is actually another version of M7351. This one will have the dipped hem and narrower skirt of View A, which looks lovely in the line drawing. After that, I have my eye on Style Arc's Italia dress. 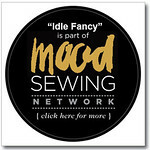 What are you sewing right now, friends? 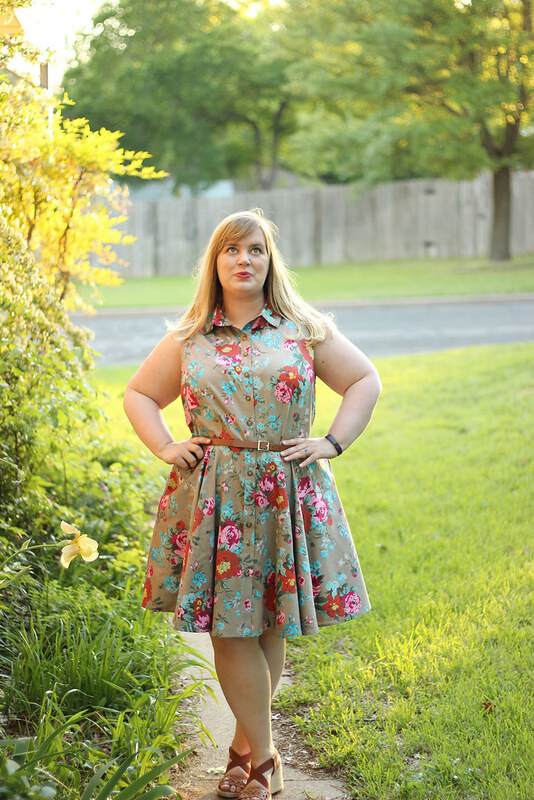 Is anyone else giving one of these new shirtdress patterns a try, this spring?